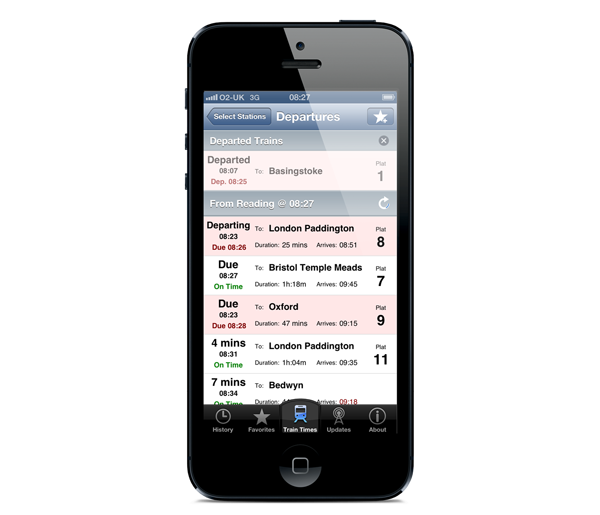 Quickly displays live real-time UK train times and platform numbers* in a native, easy to read format. 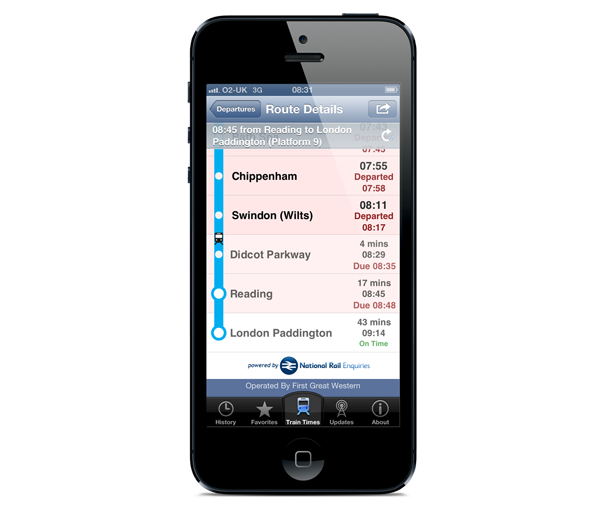 Set up and access multiple favourite routes fast, and see your trains with one touch. Exclusive 'Track My Train' functionality lets you bookmark the train that you're on, watch its progress, and text/message/mail your friends your arrival time, all from within the app! Extensive Real-Time Train Information : Tap on a Train to see it's stops and estimated arrival times, along with the predicted position of the train! Customizable favourites. Set up your regular journeys and choose icons for them from a set of over 50 predefined images! Smart and flexible : If you live/work between 2 stations, optional alternative To/From Stations can be specified, so you can see departures from both stations combined! Live Updates : Fast, in-App Access to the most mobile-friendly Live Service Update pages for each Train Operator! Plus loads more exclusive and exciting features to come! Download it today from the App Store. Recently named the No. 1 Train Information App by London24.com! Join the thousands of other rail passengers who now travel with pleasure thanks to Live Train Times - Download it today from the App Store. We love hearing from our customers, both current and new, and we think you deserve the best when it comes to support! You can contact us at hello@livetrainsapp.co.uk or use the Contact button on the About tab in the app. We read and respond to all emails and will always do our utmost to help you with whatever queries you may have. Live Train Times features a URL Scheme which allows other apps such as Workflow and Launch Center Pro to interact with it. The various URLs supported are detailed below. Shows the current trains for the named favourite. Replace <favourite name> with the name of the favourite to display. Replace any spaces in the favourite name with '_'. Replace <from station code> with the code of the station to show trains for. This is optional - if no station code is supplied the app will show the trains from the nearest station if location detection is enabled. Replace <filter station code> with the code of the station that trains must call at to be shown. This is optional - if no filter station code is supplied the app will show all the trains from the 'from' station. Note: Station codes can be found from the Station search screen - they are 3 letter codes shown in brackets after the station name, also known as CRS codes. LiveTrains://departures/PAD/MAI : shows all trains departing London Paddington calling at Maidenhead. Replace <at station code> with the code of the station to show arrivals for. This is optional - if no station code is supplied the app will show the trains arriving at the nearest station if location detection is enabled. Replace <filter station code> with the code of the station that trains must have called at to be shown. This is optional - if no filter station code is supplied the app will show all the trains arriving at the 'at' station. LiveTrains://arrivals/PAD/MAI : shows all trains arriving at London Paddington coming from Maidenhead.